Everything You Need to Know About Utah: What’s APL? When it comes to knowing everything about the Utah Utes, it’s not wrong to note Delon Wright. And while that’s both short sighted and narrow, it’s not entirely inaccurate. He’s just really damn good. But after two double-negatives in nearly as many sentences, credit where credit is rightfully due: Larry Krystkowiak. In my estimation he’s the man with the plan and its come to near perfect execution. He built his program for the 2015 season (and most certainly beyond) and that’s exactly how things have played out. So more about this team. We know Delon Wright is really good and that he’s uniquely gifted at getting to the rim. Last year it was at insane levels as 62% of his offense was a layup or dunk attempt which he made 71% of the time. He exploded onto the scene and to the rim and we took notice. My high school baseball coach used to tell us that each day we either got better or worse. We never stayed the same. If that were the case, then we were expected to steadily improve. The goal to get better each day. So maybe it’s OK that TJ McConnell struggled out of the gate. He was playing at a historically low offensive rate and Arizona didn’t look its presumed dominant self. His shooting percentages through the season’s first five games was flirting with devastation (31%). Everyone who proclaimed Arizona to be shooting inept was validated in their concern. Games tip shortly and what do we need? More data and charts! I took one more run through each of the Pac-12 teams and highlighted a statistic or philosophy central to their success – or otherwise – and how their forthcoming opponent(s) might behoove or limit that skill. As we see here, Wisconsin might be the most susceptible to the Christ Air attack. But that may be a little too far ahead of ourselves. Anaheim isn’t far from San Diego, but it’s pretty far from San Diego if we’re step-in-step right now. Weber State does a good job of limiting this, actually third best in the region, and as they are Arizona’ first opponent, they’re worth noting. Interestingly enough, Arizona’s first weekend opponents all do a pretty fair job of limiting transition work. They each do this by also not crashing the offensive glass. Each of these opponents ranks greater than 200th in OR%. 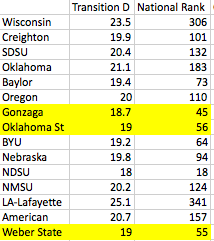 In short, these guys shoot and get back on defense – a similar strategy to Cal (207th in OR%, 53rd in transition D). The benefit to Arizona is they already rebound the ball well defensively and they don’t necessarily need Christ Air to win. But it sure helps. The mid-range game seems to be a lost art. Not in Westwood, it isn’t. 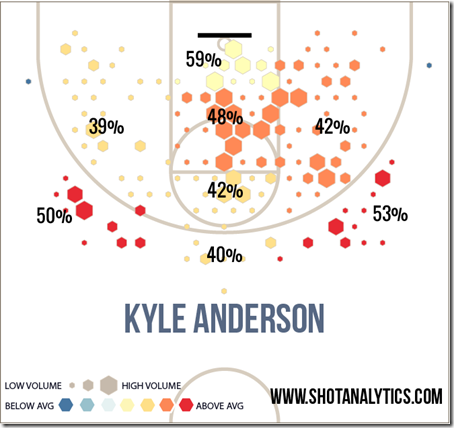 Awhile back we examined how Kyle Anderson affects the game. In that study we didn’t report on it – focusing on the rim – but Anderson takes the most shots in the 2-pt jumper range amongst all of the players studied (5.9/game). He was the fourth most effective at creating offense in that range as nearly 55% of his 2-pt jumper possessions result in a score. As the PG of this team, Anderson sets a mid-range tone for this team. Wanna see? In looking at this, I have two quick reactions: 1) Good luck, Tulsa, and 2) Gimme that VCU-UCLA matchup for all of the reasons and then some. Here is my Mid-Major with a budget. The team that lives by the three and dies by it, running into the NCAAs on an 8-1 streak and connecting on greater than 47% of their threes in those wins. And it didn’t matter who they were playing! 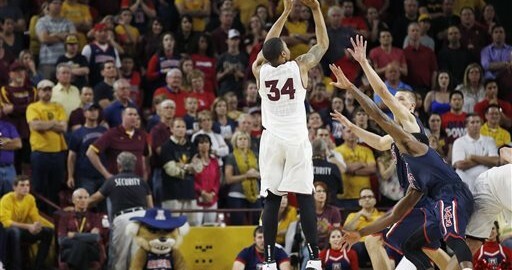 Arizona allows the 308th most offense from 3-point territory. Ducks didn’t care and made 10 threes, just the seventh team to make reach double digit threes in five years against Arizona. They shoot to win. But once again, let’s ask: Who’s going to let ’em? If you hadn’t been paying attention, please note that there will be a lot of points scored in this Oregon-BYU game. The Ducks take 33.1% of their offense for deep and make the 19th highest percentage of them (39.1%). Live and die and it appears the Cougars are going to be willing to give the Ducks their chance. In beating BYU earlier this year, Oregon was 10-32 from deep. Because of BYU’s pace, Oregon will have plenty of chances to make every varietal of basket. But let’s jump ahead to Wisconsin. Bo Ryan predicates his defense on not letting teams shoot three pointers. That 25.3% 3FG/FGA rate ranks sixth in the nation. The Badgers’ haven’t allowed 30% of offense to come from deep in five years. But here’s the thing, Oregon doesn’t care. They didn’t when Arizona came to town and they won’t should they earn the opportunity to play the Badgers. Live and die. This is the worst matchup in the second round. I calculated it by seeding standards and Jason sort of calculated it by scouting standards. I note that he only ‘sort of’ did because he didn’t break things down for all 36 opening games. It doesn’t necessarily look good for Colorado. But let me give you the silver lining. Pittsburgh takes the 272nd longest possessions in D-1 basketball. Subseqently they play the 293rd fewest possessions per game. This game projects to have just 63 possessions per KenPom. But did you know, the Buffs are 5-2 in games played to the tune of 63 possessions or less. Such a pace of game suggests an opportunity for Colorado to keep the game close, an opportunity for a last shot. Of Pitt’s 34 games, 15 were decided by 6-or fewer points (thanks, Jason). Keep it close – as Tad’s methodology tends to dictate – and the Buffs could have a chance to advance. Where they’ll likely meet Florida who is even slower than Pitt! But even better on offense and defense. And they’ll all be in Orlando. And they are the odds on favorite to win everything. G’luck. Red indicates games in which the Devils held the opposition below their in-conference OR%; yellow indicates games in which Bachynski was held below his normal DR%. Turns out, rebounding is a team effort. It would also seem that when the Sun Devils come together to collectively rebound, they’re pretty successful; 2-1 to be exact with the outlying loss – in Tucson – coinciding with the fourth worst defensive effort by the Devils (1.2 ppp). Now a six game sample set doesn’t indicate much, but if I’m going to take anything away from this, it’s that the Devils seem to bode better by limiting offensive boards, and Jordan Bachynski is just a cog in that machine. Also note that he’s not generally in the best position to rebound as he’s often in position to block shots. Those swats are recovered by his teammates or himself – all Devils however you slice it – 43.2% of the block. If they can manage to keep the Longhorns to fewer second attempts, then the Devils have a better chance at keeping Texas below 1ppp – a feat the Devils managed in each of their four wins against tournament teams. In that same post where Dylan notes Kyle Anderson and UCLA’s mid-range mastery, he also notes Stanford’s mid-range misery. Hoop-math, where I would’ve found this information, suggests that the Cardinal aren’t half bad; taking 38.8% of their shots there and making 40.4% of them. My guess is that this FG% is inflated with closer-to-the-rim-than-expected data drawn from play-by-play game logs (Shot Analytics reported 24% FGA and 35% FG%). That’s fine. What Dylan presents is derived from Synergy Sports which is taken from reviewed game film. Papa like and papa trust. Alas, what this overwhelmingly demonstrates to me is the individualized style of ball Stanford plays. The Cardinal rank 290th in percentage of made shots that are assisted; 281st on 2pt jumpers. Meaning these are shots the Cardinal are creating. Comparatively, UCLA’s mid-range game is fed by execution. Nearly 50% of their 2-pt jumpers are assisted (22nd best). So how does this translate into the weekend? New Mexico allows the 10th lowest FG% from 2-pt range in the nation (29.9%). That’s data derived from hoop-math which we assume already has an inflated 2-pt FG%. Now consider that teams are shooting below 30% from Stanford’s favorite spot against New Mexico and further consider that our story assumes that’s an inflated number. Stanford might have to find another way to score.